Z Tau is an interesting Mira that has been observed by AAVSO observers and members since 1904. Nearly 6,000 observations are in the AID from over 400 different observers as can be seen in the light curve shown below which displays all observations in the AID. It is not one of the Legacy LPV Program stars, however there is a good reason why it deserves some special attention! It's spectral class is S7.5,1e(M7e) according to the VSX and is classified as a Mira. The GCVS lists Z Tau as having a visual magnitude range of 9.5 to 18.0 with a mean period of 466.2 days whereas the VSX lists the period as 446 days. This discrepancy will be explained shortly! An interesting feature that can be seen from the overall light curve is recent CCD observations since 2000 has shown that Z Tau has a significant amplitude range as listed in VSX and GCVS. Prior to that the curve at minimum appears to “bottom out” at around magnitude 14. Cooney, et al (2009) summarised results of CCD observations of the star down to it’s minimum brightness of around magnitude 18 and they note that it is the presence of a close comparison star which results in the erroneous minima which can be detected from the visual data. The VSX entry contains a warning note for for Z Tau that the star has a mag 13.7 companion 5” to the NE of Z Tau and a mag 16.7 companion 6” to the SSW. This note is repeated on the VSP chart when plotted out. Langhans (1987) reports observations of a companion 3” SW of Z Tau that was around 13th magnitude, so there appears to be some discrepancy in position of the 13th magnitude companion between Langhans and Cooney et al. Z Tau is currently approaching minimum (Jan 2018) and all CCD and visual observers are urged to take extra care when observing this star. There is a useful Forum thread (https://www.aavso.org/z-tau-reminder) that discusses Z Tau in this context. Readers are also referred to the LPV Double Trouble Campaign page that highlights a list of LPV’s with similar problematic companion stars (https://www.aavso.org/lpv-double-trouble-campaign-0). The light curve based on the last 2,000 days is shown below and clearly shows that many CCD and visual observations have had problems with distinguishing between Z Tau and the companion star. The amplitude of nearly 9 magnitudes is quite large for a Mira. However the most interesting feature of Z Tau is the appreciable change in it’s mean period over it’s observational history. The GCVS notes that the mean period was 499.9 days between 1900 and 1931, 486.2 days between 1931 and 1965 and 466.2 days since then. 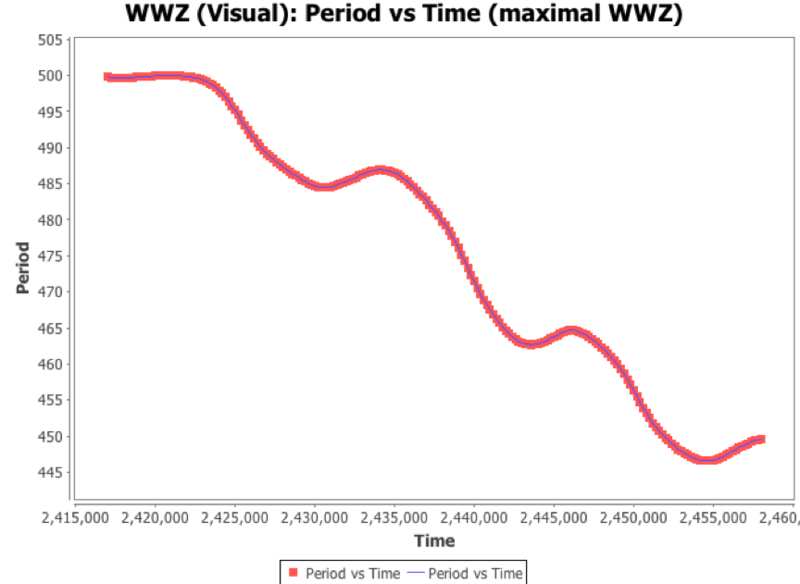 A WWZ analysis has been conducted (shown below) based on all observations since 1904 that clearly shows this steady decrease in period. The mean period has decreased from 500 days to about 450 days over the last 113 years. An analysis of the data based on the last 5 cycles (up until Jan 2018) confirms a current mean period of 451 days. Based on this, it would appear that the average period as detailed in the GCVS is probably in need of an update! 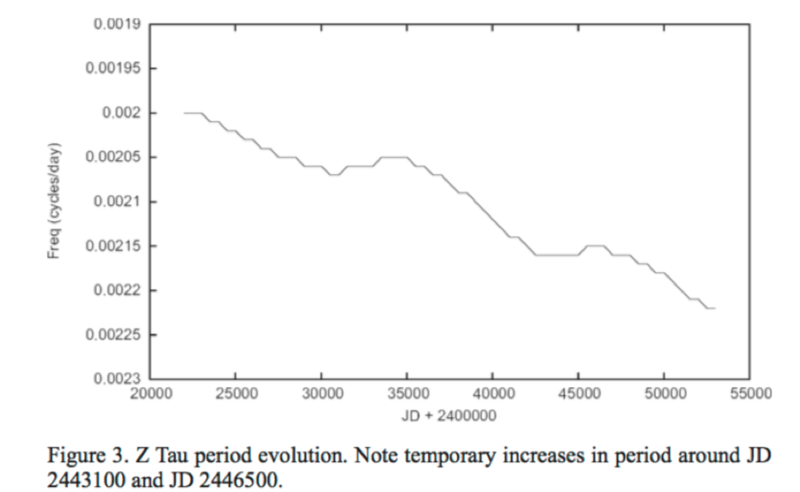 There have been a number of JAAVSO papers that have highlighted this secular decrease in period in Z Tau. The WWZ analysis presented above is in close agreement with that presented by Price et al (2005). Price et al noted a number of episodes where the apparent period change was not monotonic. In fact the period actually increased. This is clear on the WWZ plot above. Below is a similar analysis plot based on frequency versus time in the period 1976 and 1986 that clearly show these increases. Furthermore they performed an analysis and calculated that these episodes of non-monotonic decrease are separated by 43 +/- 4 years. Their analysis was only up until 2004 and since that time a further non-monotonic decrease episode has occurred starting around 2009 such that the average period is now closer to 447 days as opposed to their derived average period in 2004 of 442 days. They attribute these episodes to cycle to cycle period fluctuations of a non-evolutionary nature. Nagel (1986) highlighted the changing period even earlier. Nagel also calculated the mean radius of Z Tau as being 270 solar radii based on it’s period, spectral type and absolute magnitude. Both Templeton et al (2005) and Uttenhaler et al (2011) provide some context regarding the mechanism in Miras that could explain this significant period change. Mira variables are believed to be in the asymptotic giant branch (AGB) phase of the HR diagram. Whilst a hydrogen burning shell is the main source of energy for the star in this phase, this can be interrupted at certain intervals by powerful ignitions of a helium burning shell. These ignitions are termed helium shell flashes or thermal pulses. It is believed that the thermal pulse has a significant impact on the star including the pulsational period. It is believed that these thermal pulse events may last for 300 to 400 years for a typical solar mass star. However it must be noted that a number of researches have proposed alternative explanations for the observed period changes which do not require a thermal pulse to occur, so this would be the subject of ongoing research. Both references cited are an excellent source of information on this phenomenon. Templeton et al (2005) specially analysed Z Tau and derived an average decrease in period which they propose is consistent with theoretical rates of decrease derived from a model of the later stage of a thermal pulse. Z Tau is an interesting LPV to follow so all are encouraged to maintain the coverage and be wary in particular of the close comparison star as noted above.